We are into the business of manufacturing, exporting and supplying high quality and impurities-free Curcamin Powder. It is hygienically processed using advanced machines at our up-to-date processing facility. We make available our Curcamin Herbal Powder in quality packaging of different quantities. Moreover, buyers can obtain Curcamin Herbal Powder in bulk quantities from us. More About Piperine Curcamin Herbal Powder : Curcumin is a diarylheptanoid. It is the principal curcuminoid of turmeric, which is a member of the ginger family (Zingiberaceae). Turmeric's other two curcuminoids are desmethoxycurcumin and bis-desmethoxycurcumin. The curcuminoids arenatural phenols that are responsible for the yellow color of turmeric. Curcumin can exist in several tautomeric forms, including a 1,3-diketo form and two equivalent enol forms. The enol form is more energetically stable in the solid phase and in solution. Curcumin can be used for boron quantification in the curcumin method. It reacts with boric acid to form a red-color compound, rosocyanine. 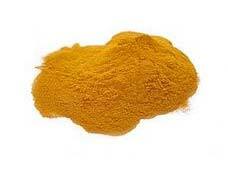 Curcumin is a bright-yellow color and may be used as a food coloring. As a food additive, its E number is E100.